For most girls in Vietnam, the typical high school memories consist of a long slender white Ao Dai. 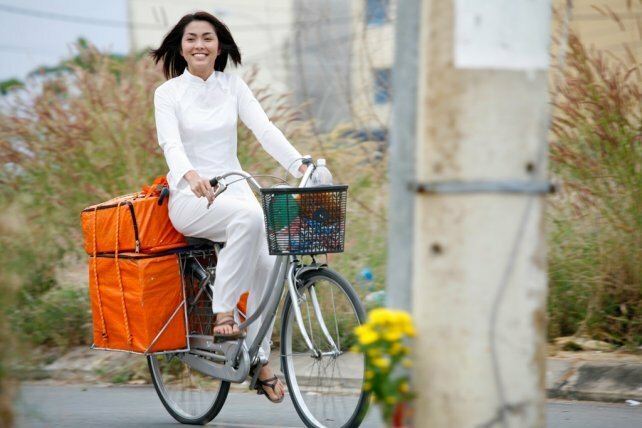 For years, this white Ao Dai has become a symbol of class and grace that is not only cherished and respected but is also a unique image that belongs solely to Vietnam. However, as the country steps further into the 21st century, the traditional white Ao Dai is gradually disappearing from school grounds. In its place, instead, are cute little uniforms that trend those of its Asian counterparts. Which brings us to the age-old dilemma: tradition versus modernization or Ao Dai versus shirt-skirt uniforms. For upcoming high school students, modern uniforms are more appealing in that it offers more comfort and less hassle in daily tasks. With the desert-like heat in most parts of Vietnam, the Ao Dais can be quite stuffy and irritable to wear for the entire course of a day. Not only that, it’s inconvenient for students to partake in activities such as jump rope, running, hacky sack and biking. A button could come undone, dress tripped over and easily tangled then ruined. These disabilities are less worrisome with uniforms, as many would argue. Not to mention, insecurities also skyrocket when the slightest bit of weight is gained for bodily imperfections are ultimately magnified by the form-fitting attire (but from the half-full glass perspective, this ought to encourage anyone to stay fit). While modern uniforms are growing among teen girls, surveys indicate that 80% of high school males still believe that Ao Dais are the most beautiful clothing a Vietnamese girl could wear, favoring it to the shirt and skirt alternative. As for girls post-high school and continuing their studies abroad, many even brought along their Ao Dais to wear on special occasions and to keep a little piece of home with them. The traditional gowns have also penetrated into many countries’ fashion as more and more come to appreciate the beauty of the Vietnamese Ao Dai. The dilemma still stands as mixed opinions on uniforms continue building. While uniforms offer a more adorable and versatile way of life, it could ultimately erase the elegance and beauty that has been a symbol of Vietnam for so long. What are your opinions and thoughts on this matter? i hope they continue with the ao dai’s although i can understand the inconvenience they bring to sports ect. maybe use just for special occasions? That’s sad, how the country is losing tradition to modernization. They can always modify the ao dais to make it more convenient like make the sleeves shorter, less buttons and so on. There’s something called building a locker room, so that students can change into their pe uniforms. Seems like Vietnam is slowly losing it’s identity. Those uniforms don’t look nice either. They both have their point. last time i went to vietnam…i don’t see much ao dai nor do I see that kinda of shirt and skirt uniform. like the above comment mention…maybe they could redesign the ao dai to have a modern twist that more convenient. But i still felt that though tradition is important…but it the country to need to modernise to increase productivity. Tradition will always be part of us…can’t be lost. i think a compromise could be made with a modified ao dai for school uniforms. it would be hard though, as part of the signature look of this dress is that form fitting design and the unique cut it uses..
eventually, the ao dai will be renegated to special events. Cost, ability to wear, and hassle will all make uniforms more favored, even if its not the best option. but i will be quite sad, i really love the look of ao dai on the ladies, it creates a classy and cute look.. Even if the students get to wear skirts and blouses, it would be inconvenient when playing sports. What if they're playing jump rope and their skirt jumps up with them? It will lead to students pulling them up higher and trying to get attention. I hate to say it, but that does happen. This would cause the school even more trouble. And we have to consider cost in all this. I'm assuming a lot of the students are poor.. how will they be able to afford the new uniforms? At my school, whenever it was PE time, all the students had to change into sweats and we had to pay for it. So not only will these students be paying for a new uniform, they would also be buying a new sport attire… considering skirts are not suitable for sports. Sometimes change is better, but in this case, I don't think it really is. .. But then again, I don't wear an Ao dai everyday to school, so I don't know its inconvenience. I hope a good solution will be found, one that still perserves our tradition and satisfy the students' wants. It would be very sad to see our old tradition slowly being erased. anyway I woudln’t compare vietnam’s heat to desert heat at all lol. it’s humid. though it gets cold in the north. these type of white ao dai are actually usually very thin layered anyway, it’s not that hot. Guess I don’t have much of a say in this topic since I live in the US and haven’t worn an Ao Dai since I was like 10 but I really do love the elegance of the white ones. It’s really a trademark of grace and beauty for young women. However, I’m a finicky dresser. I would prefer the comfort of the uniform but would still like to keep tradition by wearing them on special occasions or once a week. down with the skirts. i’m sick of us trying to mold after others. the ao dais are beautiful and unique and should be worn. i will never understand vietnam constant needs to fit in and modernize. Why change what is good? I vote for Ao Dais all the way!!!!!!!!!!!!!!!!!!!! Holy crap, they are no longer look like vietnam 40 years ago. this is lame…is it really “modernization” or are they just trying to copy the trends and style of other Asian countries? Japan, Korea and most all the other countries in Asia have the skirt and blouse uniform for girls–a very western style, Vietnam kept it’s lovely traditional attire. Tradition should be kept !! if they do what to wear shirt-skirt they may do it outside school!! but ao dai makes it noticeable that this is Vietnamese female student and is unique among all countries!! dont try to copy cat korean or japanese! I kno its cute but WE ARE VIETNAMESE!